Eirik Haldurson is a hitman. Kidnapped at age five and cruelly trained by his captor, he is today one of the most sought-after contract killers alive. Emotional distance from his targets, brutally beaten into him until it became second nature, is now the only way he can function. Lately though, that distance has started to elude him. And when a Colombian drug cartel contracts Eirik to take out ex-soldier-turned-vigilante, Matt Moreno, distance is suddenly as close as heat to fire. And all hell breaks loose. Or so I hope. I’ve spent the better part of 2018 laying the groundwork for a rebuild of my fledgling author career. And I’m quite thrilled to be able to talk about one of the results. At UK Meet in September I was roped into an author collaboration for a line of dark contemporary romances called CRIMINAL DELIGHTS. Each novel can be read as a standalone and will contain a dark M/M romance. The books are organized into five themes: Serial Killer, Assassins, Taken, Organized Crime, and Obsession. So, this spring, look for (finally!) 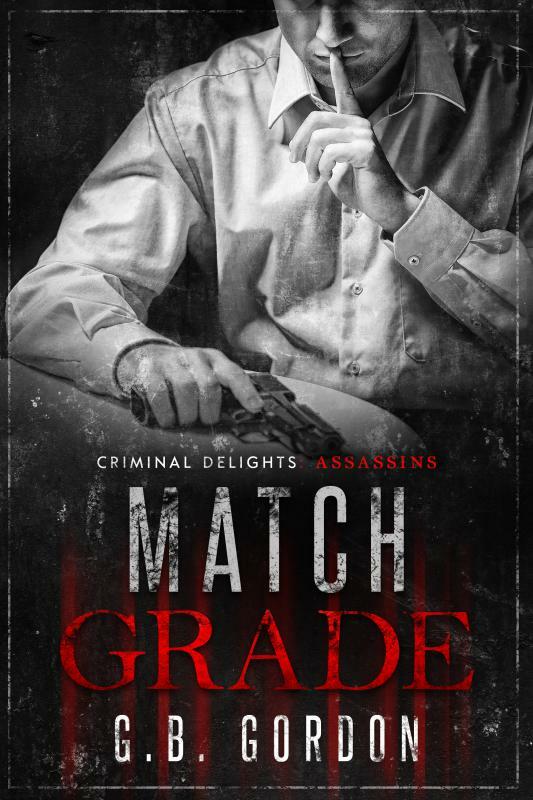 a new novel from me, in Assassins. I am very happy about this one, and I’ll be making some noise about it. … I guess we’ll see if there lays an invincible summer within me. I have received my Reversion of Rights letter from Riptide Publishing, and all my books have been pulled from the Riptide website. It will take a little longer until they disappear everywhere else. I’ve removed all images of cover art I have posted anywhere, because the copyright for the covers is Riptide’s. I’ll try to find a new home for the Santuario series, but the Bluewater Bay universe belongs to Riptide, so my Bluewater Bay books are permanently out of print. I have a limited amount of author copies of both the the Santuario and Bluewater Bay novels available for sale. Shoot me an email at gordon[at]kontext.ca or through the contact form if you’d like one. I’d be more than happy to sign it for you. There is way more in my heart I want to say about this, and maybe some day it will find its way out, but for now I have to keep it to the bare bones if I don’t want to explode in a mess all over the internet; and that would serve no one. Stay vigilant. Keep calling out those who prey on the vulnerable and those who kick down, if you can. Be safe. In light of recent events I have pulled my titles from Riptide Publishing. Since the Bluewater Bay universe belongs to Riptide, that means my Bluewater Bay books are permanently out of print. I have a limited amount of author copies available for sale. Shoot me an email at gordon[at]kontext.ca if you’d like one. I’d be happy to sign it for you. Join me and Riptide as we celebrate the release of Operation Green Card. Don’t miss exclusive guest posts, content, and of course, a giveaway! In the meantime, you can still hop on over to Riptide to check out further info on the book and, oh yeah!, pre-order. It’ll hit the shelves just in time for Christmas. Pssst, pre-orderers (that is totally a word) will get to read it two days early. So, I instagram my foodporn, as one does. And apparently this one hit a summer nerve. 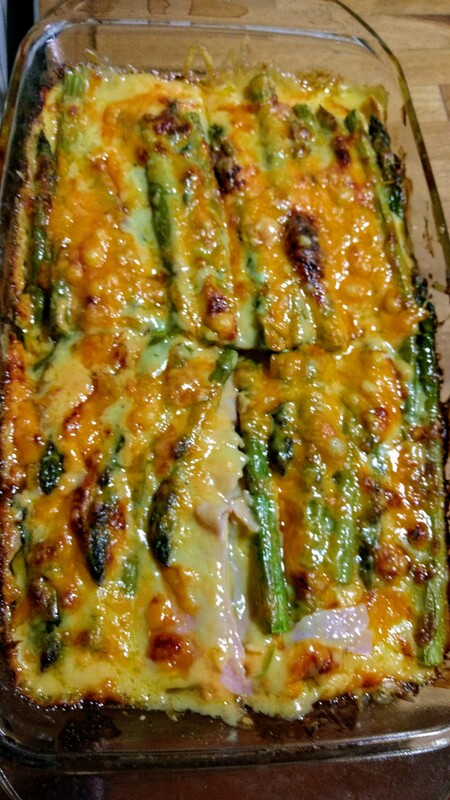 Wash 1kg (about 2 bunches) asparagus and cut the ends off. Butter a rectangular pyrex dish. 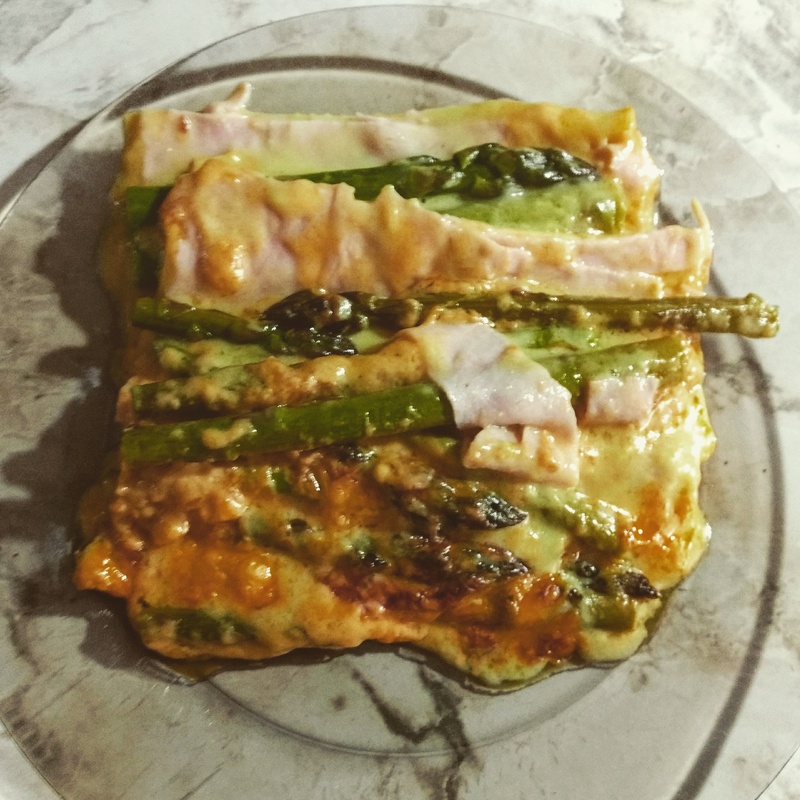 Start with a thin layer of sauce (about 1/3 of your hollandaise/bechamel), add a layer of fresh lasagna sheets (if you use dry, pre-cook them), a layer (4-6 slices, depending on size) of prosciutto cotto (deli-sliced), and half of your asparagus spears lengthwise. Repeat layers. Top with the last third of sauce and 100 g of grated cheddar.